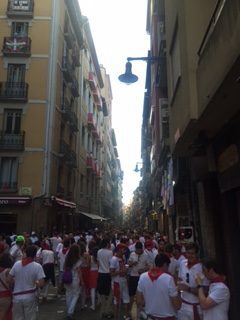 In July 2016, my friends and I attended San Fermin in Pamplona more commonly known as “Running with the Bulls.” Based on “gorings”, this run would go down as one of the worst days on record with 6 gorings. While I was glad that I ran, I would never do it again. In this post, I wanted to give you some general information about the event and the run. Get there for the opening of the festival! 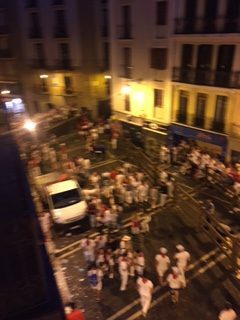 My friends arrived in Pamplona the day before the festival started and it was a great decision. The festival kicks-off in the main square at 12:00. You will need to arrive a couple hours earlier to actually be in the square. Since everyone wants to be in the square, it will be packed! (i.e., you won’t be able to move) The Sangria will be flowing and all will have a good time! There is one bus company from Bilbao that runs to Pamplona. 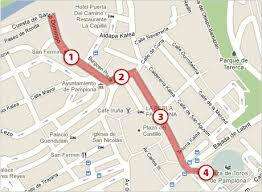 To get the bus, you will first need to get to the bus station in the center of the city. Given the tight connection, I took a cab that cost around $30. The bus ride takes a couple of hours to Pamplona. The bust station is small, and you will easily find the appropriate bus. Get the balcony! You won’t be able to watch it from on top of the fences. The day after I ran in the race my goal was to get up early (i.e., 6:00 am) for the 8:00 am race and find a spot along the course to watch the race. When you run, there appears to be plenty of spaces on top of the fences. I found out that most people party all through the night until the race the next day. As a result, all of the spots were taken by the time that I woke up. I ended up going to the stadium at the end of the course and getting a seat for $5 – $10. I wish that I had paid $60 – $80 and watched the race from one of the balconies along the course. While it isn’t easy finding cheap accommodation, drinks are really cheap in Pamplona. You could easily have a good time with $20 in your pocket. Buy the outfit in Pamplona! For~$20 – $30, I was able to buy the full running with the bulls costume in Pamplona. There are plenty of places around Pamplona to buy the outfit. Don’t be surprised if your t-shirt gets destroyed by Sangria. 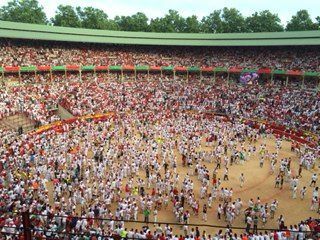 While most people including myself will skip it, there is a Carnival in Pamplona. If you are staying for more than a couple of days, I would recommend checking it out. 4 or 5 Days is the ideal amount of time in Pamplona. The festival runs from July 6th – 14th. The running of the bulls starts on July 7th. You arrive on July 5th (Day 1). You party hard on July 6th (Day 2) for the kick-off to the festival. You watch the race from the balcony on Day 3. You run in the race on Day 4 and head out afterwards or leave on Day 5 after the race. After deciding that I was going to run, the next question was where to run on the course. Most articles that you read will indicate that there is no safe place on the course. You can easily get hurt if you aren’t careful and lucky. The whole race from beginning to end lasts 2.5 minutes on average and covers 875 meters. The most important rule that everyone will tell you is that if you fall down, stay down and cover your head. You should not attempt to get back up. Several years ago, an American was killed after he tried to get back up. The bull was startled by someone getting back up and drove its horn right into the individual’s heart. If you fall, stay down and you will be ok. Prior to the 8:00 am run, you will see cops going along the course looking for people that are too intoxicated. If they find you, they will ask you to leave the course. In addition, they will look to make sure that no one has bags, go pros, or cameras out. If you plan to run, it is best to leave that stuff at home. You wouldn’t want to miss your one chance to run because you brought that selfie stick. Solo bulls are the most dangerous! There are 6 bulls (that will appear in the bull fight that evening) and 6 steers that run on the course. The steers run on the course every year and know the path to the bull ring. They wear a bell around their neck and are very calm. Their primary purpose is to guide the bulls to the bull ring. The problem is if the bulls get separated from the steers. If they are separated from the pack, they are often scared/confused and will charge people. The key lessons are to stay away from a solo bull at all costs. It is fairly unanimous that the one spot that you don’t want to be is at the death curve – 90 degree turn from 2 to 3. The bulls will often lose their footing going around the turn and will become separated from the pack. As mentioned earlier, a solo pull is a dangerous bull. The second most dangerous location would be the stadium entranceway. It is not because of the bulls, but it is because people will often trip over one another and fall. Safest spot (in my opinion)! My personal feeling is the Town Hall (right before the turn going from 1 to 2) is the safest spot. The bulls tend to go wide around the corner, which gives you the opportunity to hug the inside corner. My second recommendation would be to run on the right side of the straightaway (i.e., Estafeta) about halfway down. The bulls will tend to stay on the left side. You have the option to start the race just outside of the stadium. 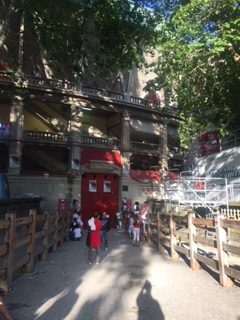 There were a number of individuals that would run into the stadium well before the bulls were even near them. The only danger is making sure not to get tripped up by people. You will get booed by the people in the stadium. People are more likely to get you injured than the bull! Most people that get injured are because they run into other individuals and fall. There are a lot of people on the course and most people are running without thinking. As a result, there is a good chance that you will fall after tripping over someone. 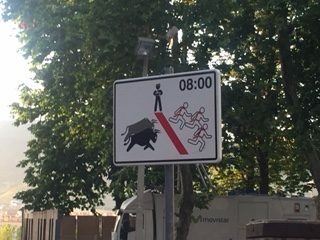 Run with the little bulls in the stadium! While you likely won’t get the best sleep in your life before the race, it is always recommended to try and get some sleep before the big race. Have a meet up spot! Most of you will run with friends. When the bulls come, you will lose track of yoru friends. As a result, it is best to have a meet up spot. These are my thoughts on the race and the festival! It was a great time. GOOD LUCK!